The literal translation of Buche de Noel is Christmas log and it is thought that this chocolate flavoured sponge replaced the centuries-old tradition of choosing and burning a Yule log when open fires became less commonplace. Paul made this log it was delicious. Heat the oven to 200C (gas 6). Brush a 33cm x 23cm Swiss roll tin with melted butter, and then line with baking parchment and grease the paper. Dredge with caster sugar, then flour. Knock out any excess. Sift the flour and cocoa powder together three times until they are thoroughly combined, set aside. Whisk the eggs in a bowl with the sugar until the mixture leaves a trail for a few seconds. Gently fold in the flour mixture with a large metal spoon-do not over mix or you will lose valuable air but make sure there are no pockets of flour. Fold in the walnut liqueur. Gently pour the mixture into the prepared tin, checking for any pockets of flour as you do so. Lightly level the surface and bake for about 10-12 minutes until the edges shrink away from the tin. Lay a damp tea towel on the work surface followed by a sheet of baking parchment. Dredge the paper with caster sugar. Carefully turn the cake out onto the paper. Leave to cool for about 4 minutes, and then carefully peel away the top baking parchment. Trim the crusty edges. In a bowl add the chestnut puree and the walnut liqueur, and then spread carefully over the sponge. Roll up carefully and leave to cool. Make a bain-marie by taking a large pan and fill a quarter full of water. Place the chocolate into a small bowel and gentle lower into the pan of water, simmer the water until the chocolate has melted. 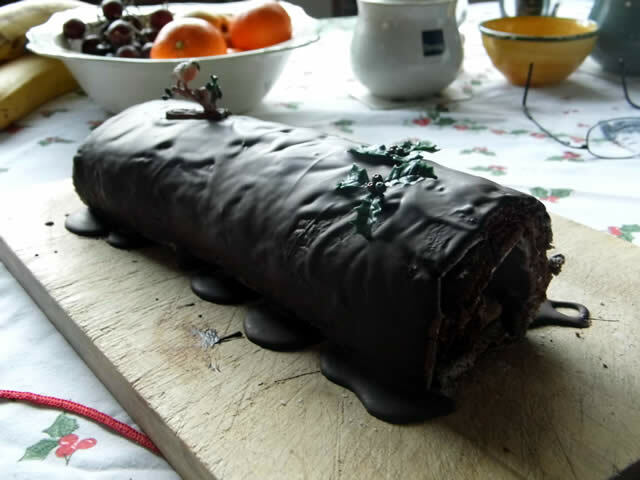 Take out of the pan carefully and place onto a tea-towel, spread the chocolate over the log and leave to nearly set, place decorations on top. The log should keep for a few days in an air tight container.